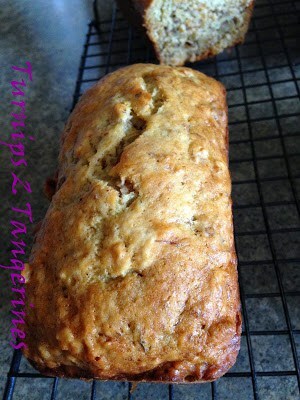 One slice of this delicious Double Banana Nut Crunch Bread and you’ll want another and another. This irresistible bread is made with mashed bananas, chopped walnuts and banana-nut crunch cereal. 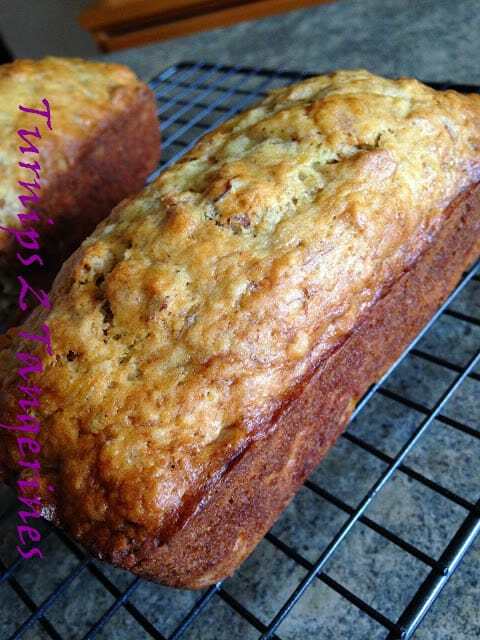 I’ve made a lot of quick breads in my lifetime and if I had to pick a favorite, double banana nut crunch bread would win for all thyme favorite. Isn’t it amazing the delicious recipes you can find on the back of boxes, packages, cartons and the like. You know what else I like about discovering recipes on the back of __(fill in the blank). All of the recipes have been tried, tested and tasted. So you know they have to be good! 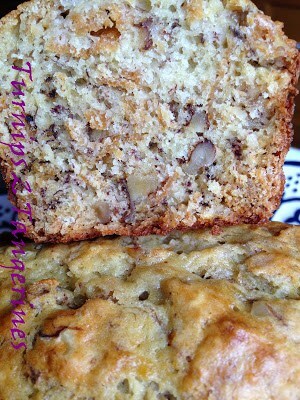 Double banana nut crunch bread is one such recipe. I discovered this recipe one morning while I was sitting at the table eating breakfast. Isn’t it funny how every morning you get up, get ready, sit or stand and eat the same bowl of cereal? That’s what I do anyway. And every morning I sit at the table and read and re-read the same cereal box. I always liked the trivia questions that were once popular on cereal boxes, way back when Trivia Pursuit was in vogue. You can actually learn some interesting stuff on the back of cereal boxes. Anyhow, let’s get back to the subject, shall we. I found the recipe for Double Banana Nut Crunch Bread on the back of banana nut crunch cereal that I purchased at Aldi for my hubby. (I personally don’t like banana flavored anything. Banana flavoring to me anyway, just doesn’t taste like bananas.) But I was desperate and hungry so I poured myself a bowl and started reading the box. Surprisingly I liked it! It wasn’t bad. I turned the cereal box around and there to my wondering eyes should appear, this fantastic recipe. Let’s get cooking! 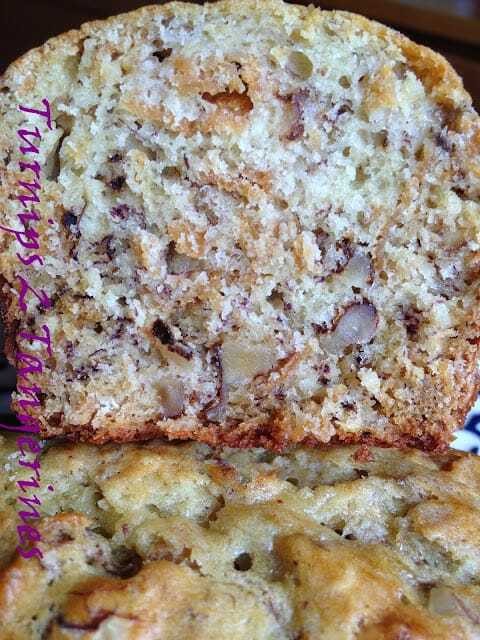 We decided to make double banana nut crunch bread in a mini loaf pan but you can certainly make this bread in a 9 x 5-loaf pan. I received a mini loaf pan (makes 4 mini loaves) for Christmas and I’ve turned into a mini loaf making machine ever since. 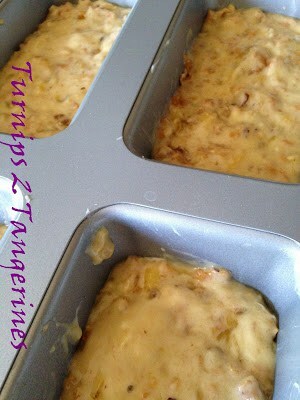 Grease bottom and 1/2 inch up sides of a mini loaf pans (4). Set aside. In a medium bowl, combine flour, sugar, baking powder, baking soda, cinnamon and salt. Make a well in center of dry ingredients. In another bowl, combine mashed bananas, eggs, oil and water. Add banana mixture all at once to dry ingredients; stir just until moistened. Fold in cereal and walnuts. Spoon into prepared pans. Bake at 350 for 50 to 60 minutes or until a toothpick inserted in center comes out clean. Cool in pans on wire rack for 5 minutes. Health Note: Fruits such as peaches provide vitamin C along with a great taste. Foods rich in Vitamin C help keep gums and blood vessels healthy.